ERBIL, Kurdistan Region – Clashes between Iraqi troops and the Shingal Protection Units (YBS) are now “under control”, Iraqi Prime Minister Adil Abdul-Mahdi said late Tuesday. Tensions are high between the Iraqi Army and the YBS, a Yezidi militia with ties to the Kurdistan Workers’ Party (PKK).The two sides clashed on Sunday night and again on Tuesday after a failed attempt at mediation. At least one Iraqi soldier was injured and there are unconfirmed reports a second was killed. “The government will take measures in a balanced way,” Adil-Abdul-Mahdi told reporters during his weekly presser in Baghdad. “Some unfortunate things occurred with groups close to the PKK in Shingal but it was brought under control rapidly. I think even the PKK takes into consideration the situation of Iraq,” he added. Abdul-Mahdi’s conciliatory tone comes in stark contrast to his predecessor Haider al-Abadi, who last year called the YBS an illegal force and ordered it to withdraw from Shingal. The situation is “totally under control,” Abdul-Mahdi said, but insisted Iraq must not be treated as “an axis” for regional conflicts between Turkey and the PKK. “We will also not be anyone’s enemy except for terror, corruption, poverty, oppression, invasion and dependency,” he said. “We do not want to be part of the conflict. There are issues which shall be addressed,” he added. Shingal is today host to a rainbow of different armies and armed groups vying for influence. The YBS, established to protect the Yezidi people from genocide, used to be on good terms with the Iraqi government, which paid the salaries of its fighters at the height of the war with the Islamic State (ISIS). Abadi halted the payments last year. The Yezidi militia had similar clashes with the Rojava Peshmerga two years ago when Shingal was under the control of the Kurdistan Regional Government (KRG). 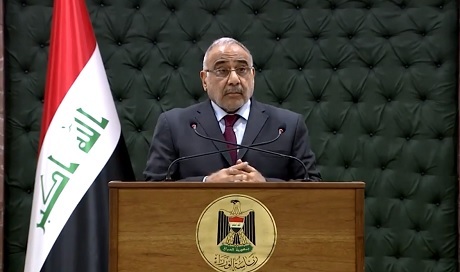 Abdul-Mahdi also used his weekly presser to tout Iraq’s opening up to the world. He told reporters his cabinet enjoys good relations with regional and neighboring countries. “The coming of ministers and heads of governments and states to Iraq in this way and with such frequency means there is a positive reading of Iraq – a reading which wants to be present now and in the future, contrary to some pessimistic expectations,” the prime minister said. Falling in the middle of the region’s rival powers Iran and Saudi Arabia, Iraq is well placed to mediate and benefit from a balanced relationship. Abdul-Mahdi’s recent visit to Saudi Arabia was soon followed by a state visit by Iranian President Hassan Rouhani to Baghdad earlier this month. “Our deals with Jordan helped us in making deals with Iran and now help in our future deals with Egypt and Jordan and our visit to Saudi [Arabia] … If we open toward Jordan, we can open well toward Iran, if we open toward Iran we can open toward Saudi, if we open toward Saudi we can open toward Turkey,” Abdul-Mahdi said. Iraq is seeking friends in the region to support the gargantuan task of reconstruction following its devastating war with ISIS. Yezidis have every right to have their own forces to protect them. We all clearly remember r The Iraqi army running away followed by KDP Peshmarga and allowing the ISIS jihadis to invade the Yezidis homeland. And we also remember that PKK and YPG/J forces running to help and save the Yezidis.